The EUROCOM Sky X9W gives customers complete control over their Mobile Workstation by giving them the ability to control nearly every aspect of their custom built, fully configurable professional grade system. Equipped with the most powerful Intel Processors up to Intel Core i7 6700K accompanied by 64 GB DDR4 memory, 5 TB Solid State storage and professional graphics up to NVIDIA Quadro M5000M powering an exquisite 17.3” 4K Ultra HD display. “Eurocom is all about freedom, freedom to choose the components of your upgradeable, custom built workstation and now users have the freedom to control the performance with an unlocked BIOS equipped EUROCOM Sky X9W Workstation” Eurocom President Mark Bialic. The EUROCOM Sky X9W is completely user-upgradeable, fully customizable and extremely flexible, allowing the Sky X9W to be configured with a variety of options including various Quadro GPUs and high performance desktop socket processors. 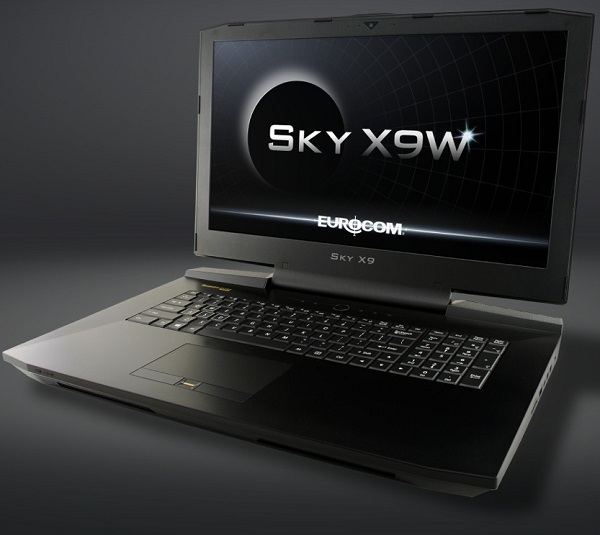 The EUROCOM Sky X9W has mission critical reliability and super computer performance with quality to last and upgradeability to improve the capability along the way. “With the performance and capability of the EUROCOM Sky X9W it is really more of a desktop workstation with an integrated display, keyboard, battery and the mobility offered therein. With the EUROCOM Sky X9W you can have a supercomputer in your laptop.” Mark Bialic, Eurocom President. Eurocom developed the Sky X9W to be a mobile supercomputing powerhouse for simulation, ray trace rendering, mobile analytics, CAD, CAE, server operations, software development, GIS on the go and so much more; while being a long term, stable system. Supporting the most powerful mobile professional graphics solutions including the NVIDIA Quadro M5000M and M3000M desktop 6th generation Intel Core i7 processors in the EUROCOM Sky X9W ensures the ability to run the most demanding engineering and design software with ease, while on the go. The EUROCOM Sky X9W M.2 PCIeX4 SSD storage allows workstation users to super-charge productivity and creativity of workflows. The Sky X9W utilizes the new NVMe protocol, designed from the ground up to take advantage of pipeline-rich, random access based storage. The EUROCOM Sky X9W supports the latest 6th generation Intel Core i7 processors up to 6700K due to the desktop Z170 chipset and LGA 1151 CPU socket. Four SODIMM are supported for up to 64 GB DDR4 memory to pair with a high performance desktop i7 processor. Professional graphics capability is supported through upgradeable MXM graphics interface up to NVIDIA Quadro M5000M with 8 GB GDDR5 or M3000M with 4 GB GDDR5 for the ultimate graphics capability on the go. To display the exquisite graphics supported din the Sky X9W we fitted it with a high pixel density 4K Ultra HD matte IPS display with a whopping 8,294,400 pixels.